» Will PSU banks turnaround with leadership vacuum? ICICI Prudential Life Insurance's recent IPO was a landmark event for many reasons. Not just because it was the first insurance company to seek listing. But also because, despite an issue size of around Rs 60 billion, it was oversubscribed ten times! The huge response to the IPO is not really a surprise given the sentiments in the market and the appetite for new issuances. But this has not been the case in recent years. Mega share sales in India's IPO market have been few and far between over the past six years. The last time there was a rush of mega IPOs was almost a decade back. Between 2005 and 2008, sectors such as energy, utilities, and real estate were in vogue for new listings. And the one thing that was common to each overhyped and hugely oversubscribed issue at the peak of the IPO boom was a blind faith. Investors had blind faith in the fortunes of the sector whose mega issues were being peddled like hot cakes. Whether it was DLF, HDIL or Reliance Power, investors bought into the sector's glory rather than the companies' financials. They completely dismissed possible challenges and pitfalls of the sector and the businesses. And the promoters were only too happy to take home valuations they could have hardly imagined. With the bull run over, the reality for each of the sectors gradually set in. Commodity prices are still at multi-year lows. The power sector is still plagued by hefty distribution losses. Realty firms are looking to shed debt by liquidating assets before they do anything else. And infrastructure firms are mired into huge losses and stuck projects. It's no surprise that investors' blind faith in these sectors' prospects did not fetch the desired result from these mega oversubscribed IPOs. The latest sector to catch investors' fancy is finance. Lenders of every size and stature, insurers, and even stock exchanges are making a beeline to raise funds. And not surprisingly, no one is going back disappointed. The big blind faith this time around is that financing cannot go wrong in an underpenetrated market like India. What's more, the biggest lenders, public sector banks, are burdened with colossal non performing loans. So the players that corner 70% of India's banking share are busy recovering loans gone bad. Meanwhile, the small ticket lenders and micro lenders are making hay while the sun shines. If you look at their loan growth, it would be impossible to believe that the banking sector's loans are growing in single digits. With the financial sector's fortunes seeming so bright, every entity related to the sector is basking in its glory. And investors are hardly thinking twice before overpaying for businesses that claim to benefit from India's financial inclusion. As with everything, there are exceptions. There are certainly a few good businesses in financing led by very capable managements that could create huge investor wealth over the long term. But investors are treating this as the norm rather than exception. If you ask us, every IPO needs to be evaluated on its own merit. When there is a need to go through a checklist for buying stocks, why not so in the case of IPOs? There are several big IPOs in the pipeline in the last few months of 2016. In case you wish to run them through a handy checklist, we have something for you. Download our Handbook of IPOs to be able to pick only the right ones for you. Most big banks in India are not lending. This is evident from the gap in the credit to GDP ratio from historical averages. 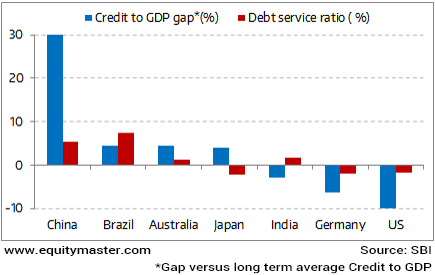 The debt service coverage ratio in India too is not very encouraging. 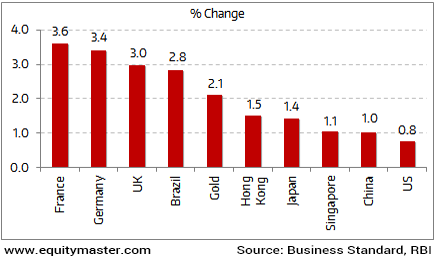 Developed economies like Germany and the US are facing paucity in demand for credit. On the other hand, China continues with lending excesses. Its credit to GDP remains a third over its historical averages. Although nowhere close to 2008, the signs of stress in global banking are evident. Management is one of the most crucial factors while assessing the health and prospects of a business. Without a clear vision and focused strategy set by leaders, businesses are likely to go directionless and out of order. Something similar seems to be happening in the banking sector. A lot of public sector banks are functioning without a CEO or Chairman - Indian Overseas Bank, Punjab National Bank and UCO Bank, to name a few. Incidentally these are the banks with gross NPAs in double digits! Their asset quality is going from bad to worse. And such banks make a strong case for rating downgrade. Even the ones where top management positions are not vacant, a 2 to 3 years stint, typical in case of state run banks, is too short for management to make any positive difference. In comparison, the private sector banks are headed by people who stick for much longer term, leading to more accountability and a long term focus. Irrespective of the amount of capital infused, it is difficult to envisage a turnaround in the state run banks facing leadership vacuum. It is time for the Government to address the management crisis in the banking sector - the backbone of the Indian economy. The US Federal Reserve in its meeting on Wednesday left the interest rates unchanged. However, Fed Chair Janet Yellen signaled that it could still tighten monetary policy by the end of this year provided the labour markets improved. During the week, Dow Jones Industrial Average (DJIA) went up marginally by 0.8%. Along with the Fed, the Bank of Japan (BoJ) too left the interest rates unchanged at negative 0.1%. The BOJ had introduced negative interest rates early this year. The move was introduced on hopes that it would encourage people to lend more and thereby spur spending and inflation. However, there has been no sign of this working yet. Along with the Fed and the BoJ, the monetary policies and low interest rates by other central banks have made things far worse than before for the global economy. Benchmark indices in Japan surged by 1.4% during the week. European stock markets too witnessed a robust week with benchmark indices in France and Germany surging by 3.6% and 3.4% respectively. Back home, the Indian indices closed marginally higher during the week. The BSE Sensex was up by 0.2%. The current account deficit of India in the quarter ended June narrowed to 0.1% of gross domestic product (GDP). This is a considerable improvement as compared to three years back, when this figure stood at an unprecedented 4.1% of GDP. Read the detailed global market roundup here. Equitymaster requests your view! Post a comment on "The Ignored Fact About Most Oversubscribed IPOs". Click here!